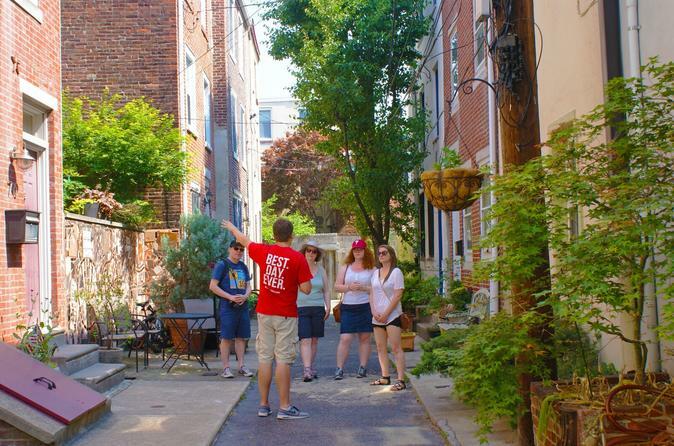 Join a local guide in South Philly on a small-group tour of public art, markets and other hidden gems in historic Philadelphia neighborhoods like Queen Village. Pass by bakeries, delis and butcher shops en route to the famed 9th Street Italian Market, where you can peruse the food stalls. Then visit the one-of-a-kind mosaics gallery at Magic Gardens, and ride a local bus down dynamic South Street or Pine Street before finishing at Fabric Row. Numbers are limited to 12 for a more personalized experience. Start your 3.5-hour tour of the art, culture and food of South Philly on colorful South Street. Follow your guide through the Bella Vista neighborhood for a first glimpse of local artist Isaiah Zagar’s stunning mosaics. After a stop at a historical deli and bakery, continue on foot to the 9th Street Italian Market (aka South 9th Street Curb Market), considered to be America’s oldest open-air market. At this must-see attraction dating back to the 1880s, wander past an array of stores teeming with cheese, chocolate, spices and olive oils. With your knowledgeable guide, meet the butchers, bakers, spice merchants and produce vendors who provide food samples to whet your appetite. You’ll hear stories of the city's early immigrants and have a chance to recreate a famous scene from the 1970s blockbuster film Rocky. Then head to Philadelphia’s Magic Gardens, a unique gallery and community art center that showcases more mosaic art from Isaiah Zagar. Meander through the indoor gallery, and be wowed by the massive outdoor mosaic structure while you hear city stories from your guide. Next up, catch a public bus for a ride down bustling South Street (weekdays) or iconic Pine Street (weekends), and then walk into historical Queen Village to soak up the charming atmosphere among its narrow streets. Finally, take a stroll past Fabric Row, America’s largest concentration of fabric shops, before finishing your tour back on South Street.